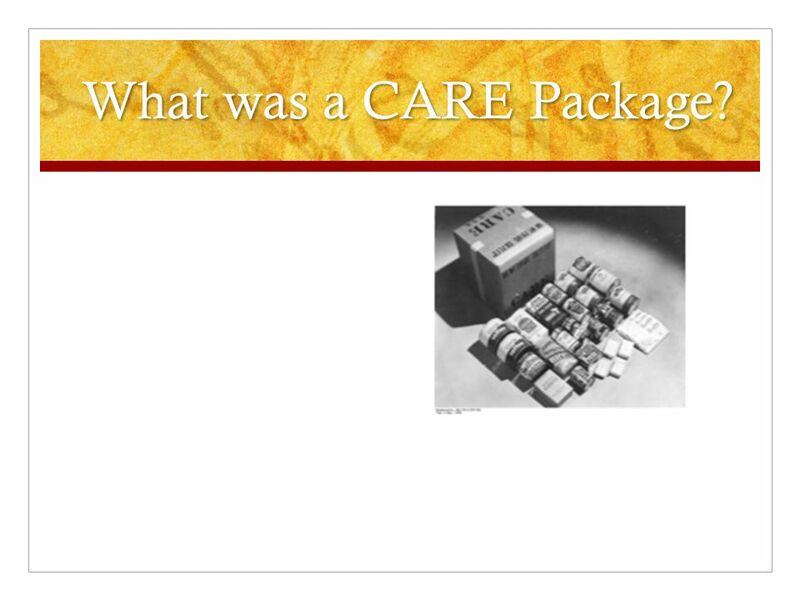 1 Cooperative for Assistance and Relief Everywhere, Inc.
4 What was a CARE Package? 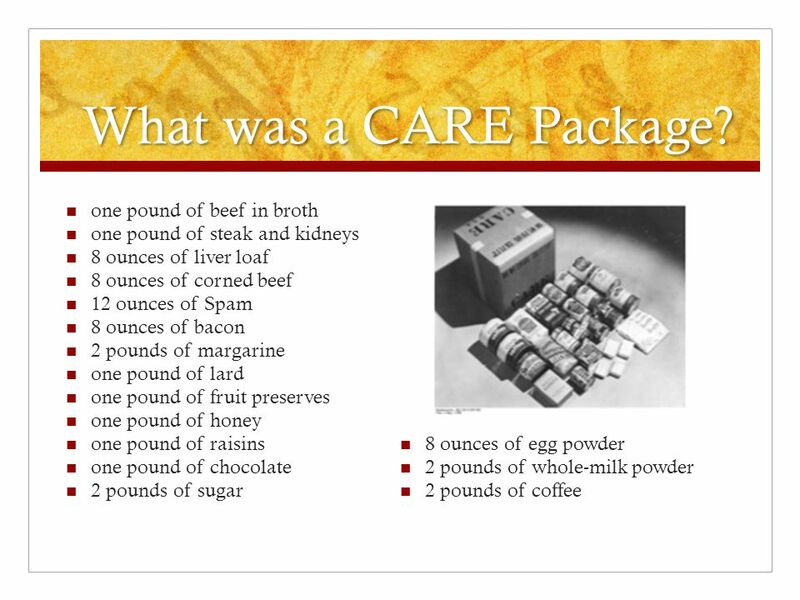 one pound of steak and kidneys 8 ounces of liver loaf 8 ounces of corned beef 12 ounces of Spam 8 ounces of bacon 2 pounds of margarine one pound of lard one pound of fruit preserves one pound of honey one pound of raisins 8 ounces of egg powder one pound of chocolate 2 pounds of whole-milk powder 2 pounds of sugar 2 pounds of coffee CARE packages were sent to people in Europe. 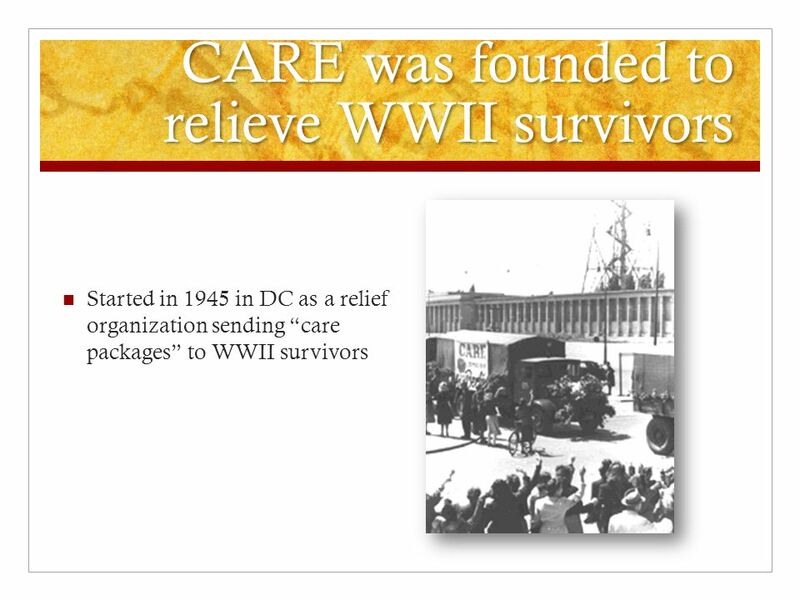 Original sending CARE packages to Germany was prohibited, but the ban was lifted in 1946. 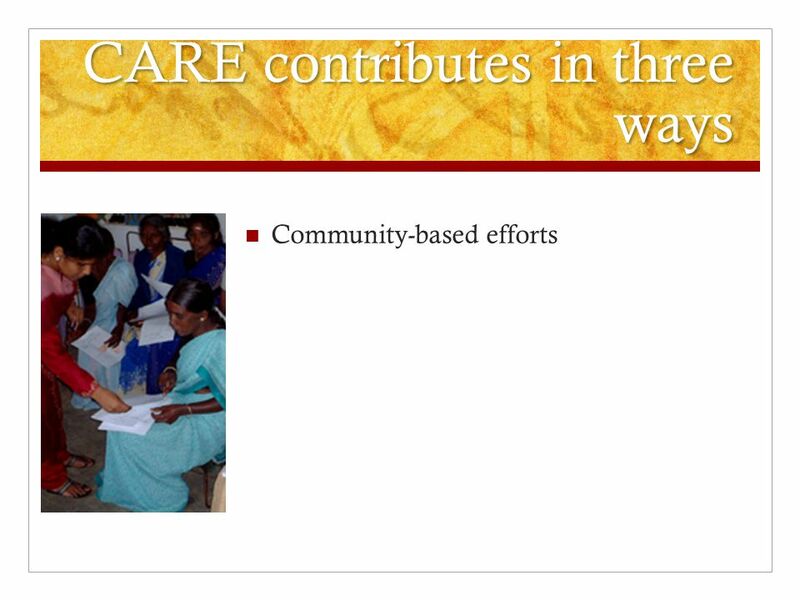 Community-based efforts -Examples of CARE’s community based efforts include improving basic education, preventing the spread of HIV, increasing access to clean water and sanitation, expanding economic opportunity and protecting natural resources. 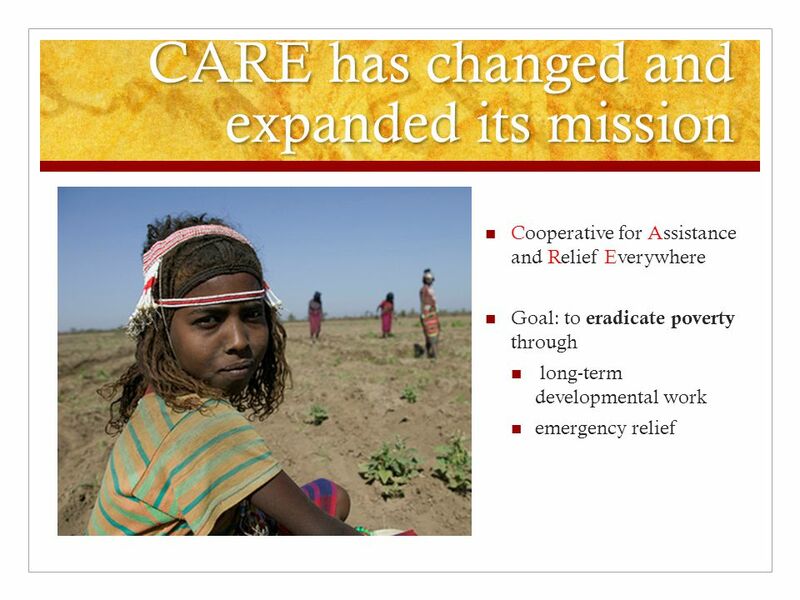 -CARE began as purely a relief organization, and although it now has long term programs, it still delivers a tremendous amount of emergency aid to survivors of war and natural disasters, and helps people rebuild their lives. -In contrast, most of CARE’s long term programs involve agriculture and natural resources, cross-cutting initiatives, economic development, education, health, HIV/AIDS, nutrition, water. 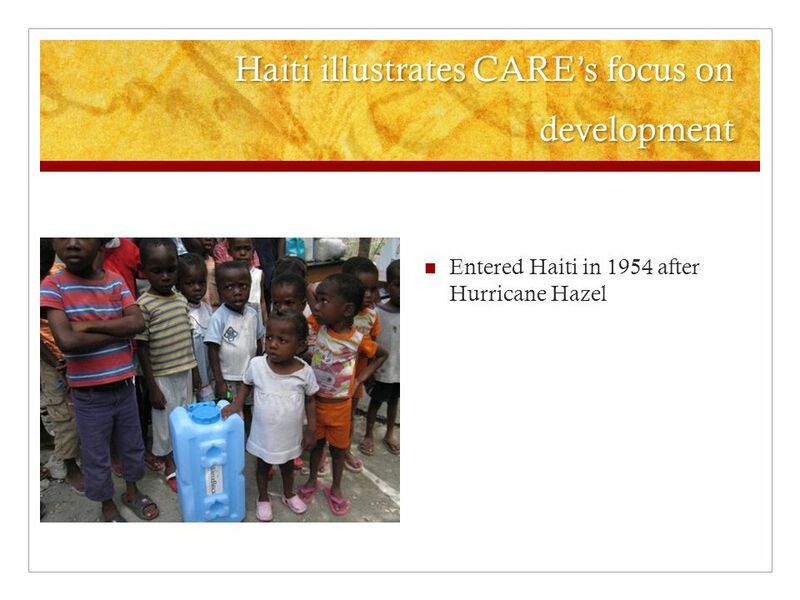 Entered Haiti in 1954 after Hurricane Hazel -CARE first entered Haiti in 1954 after Hurricane Hazel to provide relief. -In 1959, CARE began long term development projects involving maternal and child nutrition, and by the 1970s, CARE expanded to included projects providing health care for preschool children, safe drinking water and income-generating activities. 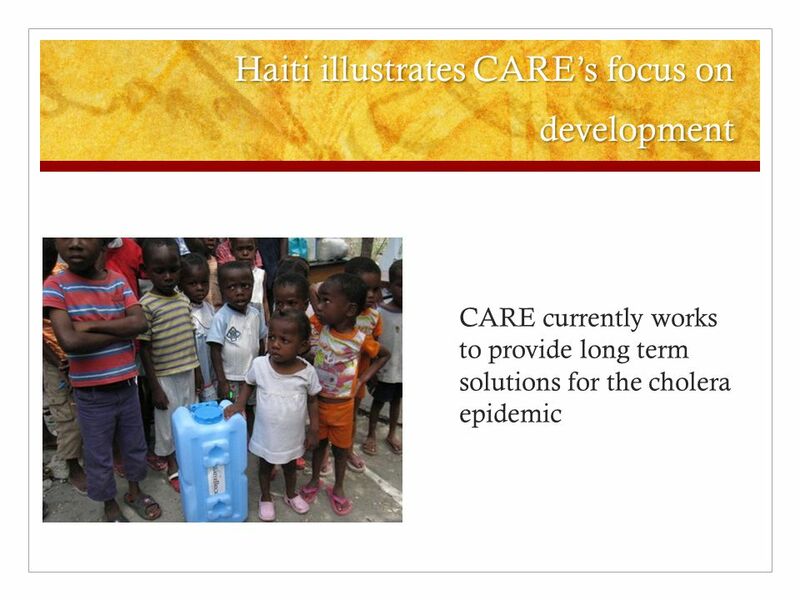 -Today there are projects in HIV/AIDS, reproductive health, maternal and child health, education, food security, and water and sanitation, along with relief services -And they work closely with NGOs, private companies, and the Haitian government for max success. 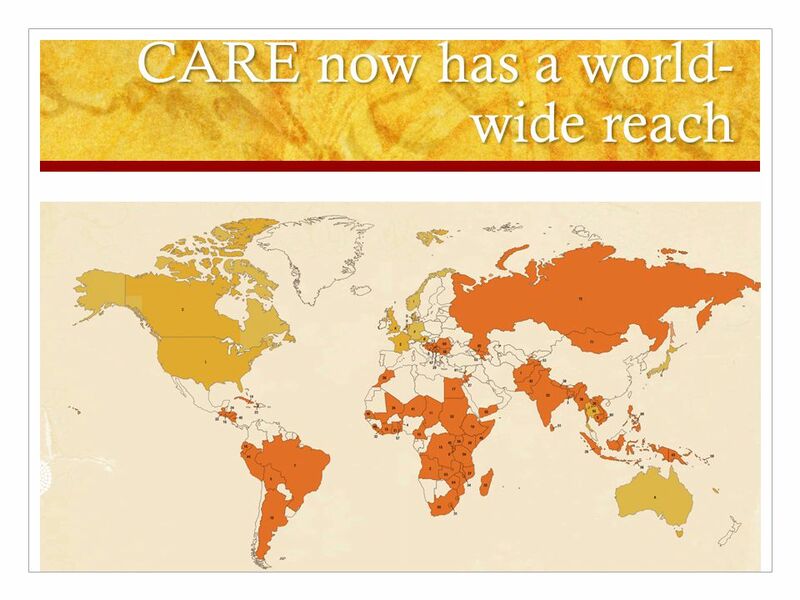 -Although CARE has its adversaries, it’s hard to deny that CARE has had a worldwide impact -For example, CARE provided almost 7 million people with improved access to school and better quality edu -Helped more than 10 million protect themselves from HIV -And CARE’s vision, although seemingly impossible, has become more attainable with the work of CARE and organizations like it. Download ppt "Cooperative for Assistance and Relief Everywhere, Inc."
We are ActionAid. How we work We work in 43 countries across Africa, Asia and Latin America We focus on fighting the causes of poverty, not just the effects. Infant Young Child Feeding Symposium June 3, 2009 Atlanta, GA Helene D. Gayle, MD, MPH President and Chief Executive Officer CARE USA. The Nutritional Value of Flavored Milk Learn about: The essential nutrients children’s diets are lacking The nutrients that milk provides How flavored. 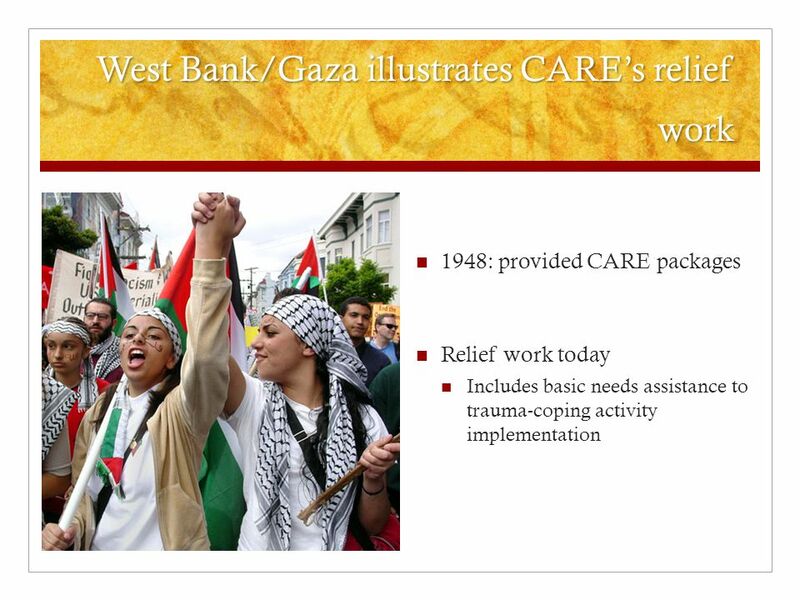 Protection during Response (Place) – (Date) Day 1 Session 4.1: Protection of At-Risk Groups. 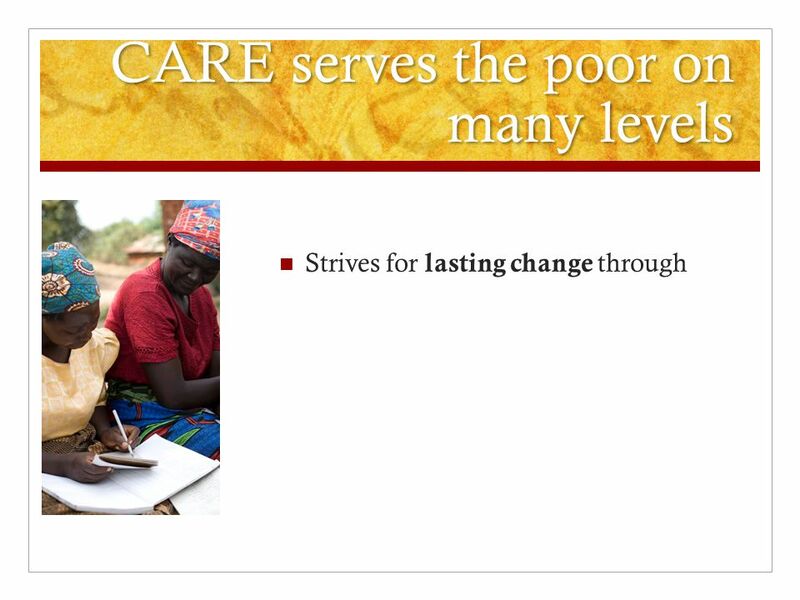 The Millennium Development Goals the fight against global poverty and inequality. Absolute and Relative Poverty. 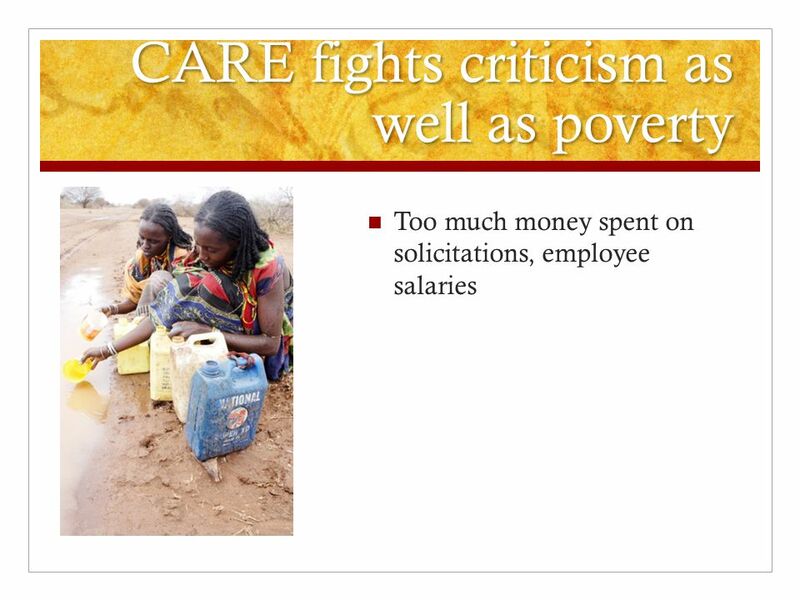 What is poverty? 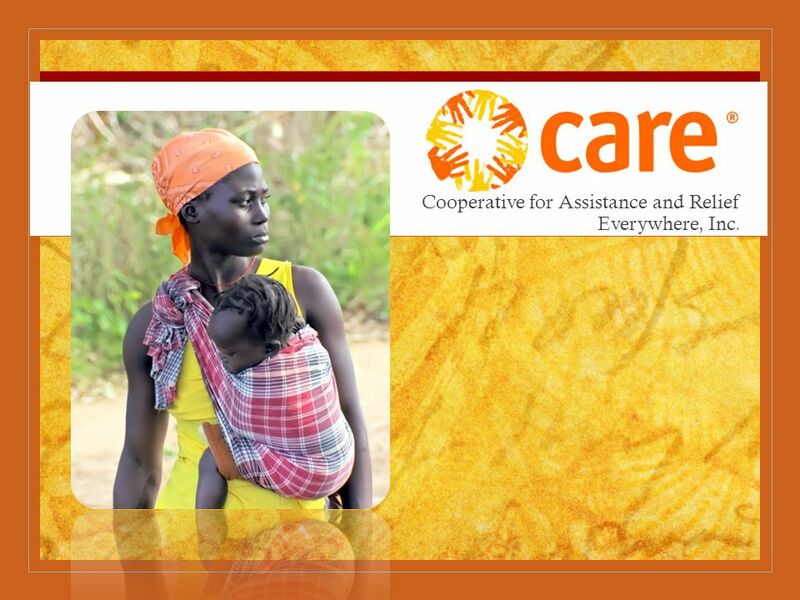 Poverty is the state of being extremely poor, with very little money, food or access to clean water. Coins for Cleaner Water American Chemical Society In partnership with Proctor & Gamble. 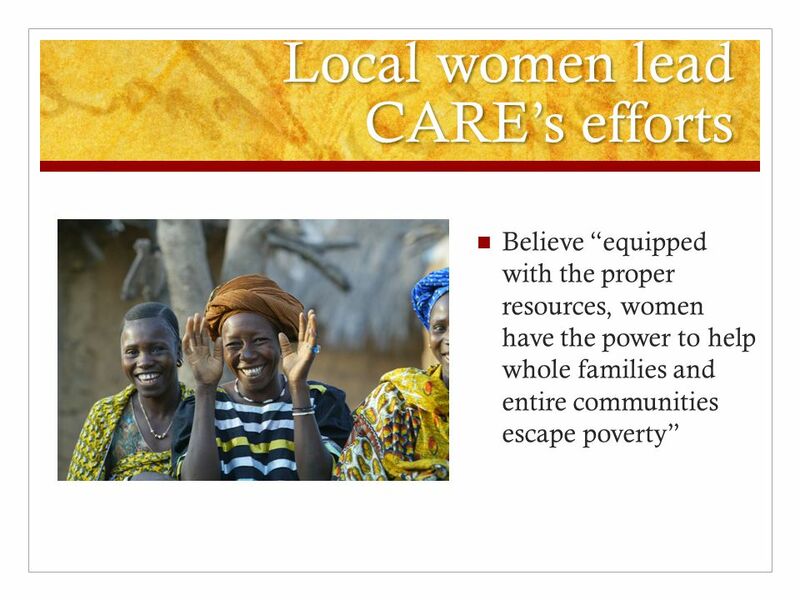 “We believe we can end poverty and injustice, as part of a global movement for change.” Paige Ganem. Skills for Social Change Across Cultures Nancy Bacon Bahia Street Anita Verna Crofts Global Health. Kelly Lindblom BIOL 402 April 15, CARE was founded during WWII C ooperative for A merican R emittances to E urope. 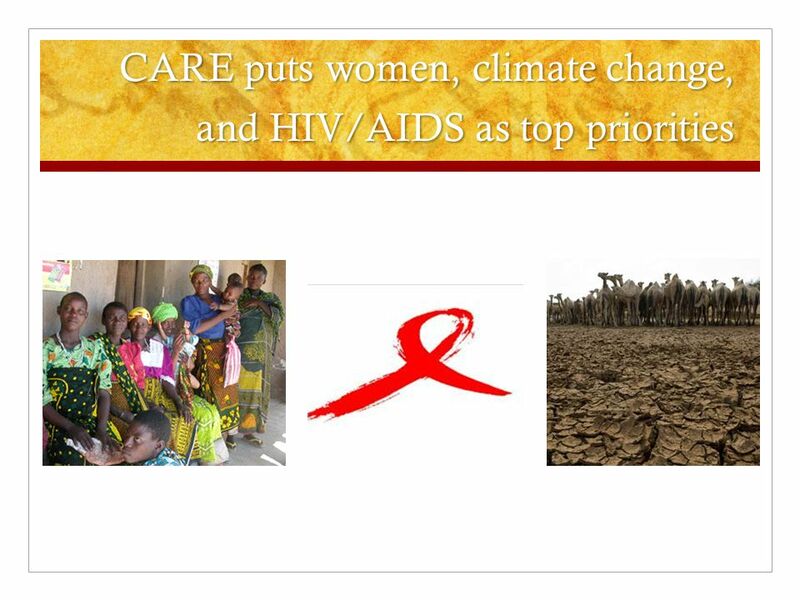 Slide 2 Key Points Although HIV/AIDS is found throughout the world, most people living with HIV/AIDS reside in low- and middle-income countries More people. 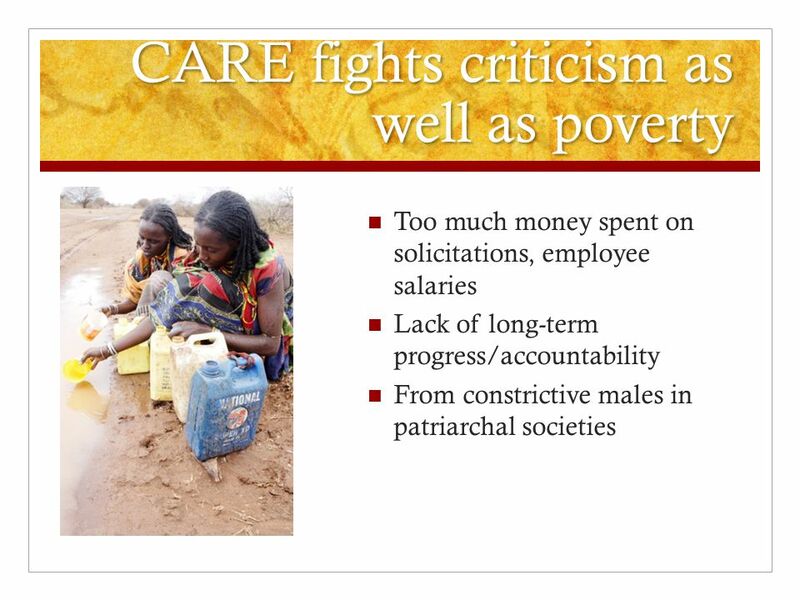 Oxfam International Make Poverty History Kate Fedder. A COMPARATIVE STUDY OF TURKEY AND BRAZIL ON SOCIAL ASSISTANCE POLICIES GROUNDING ON BASIC INCOME. 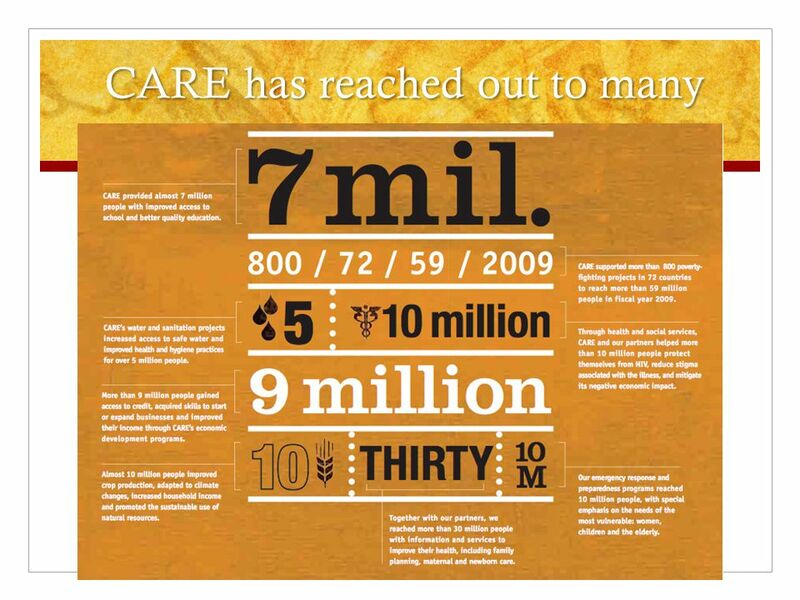 Trends & Tips for Engaging Today’s Volunteer. Today’s Volunteer What does Today’s Volunteer look like? Illustrate or use words and phrases to describe. 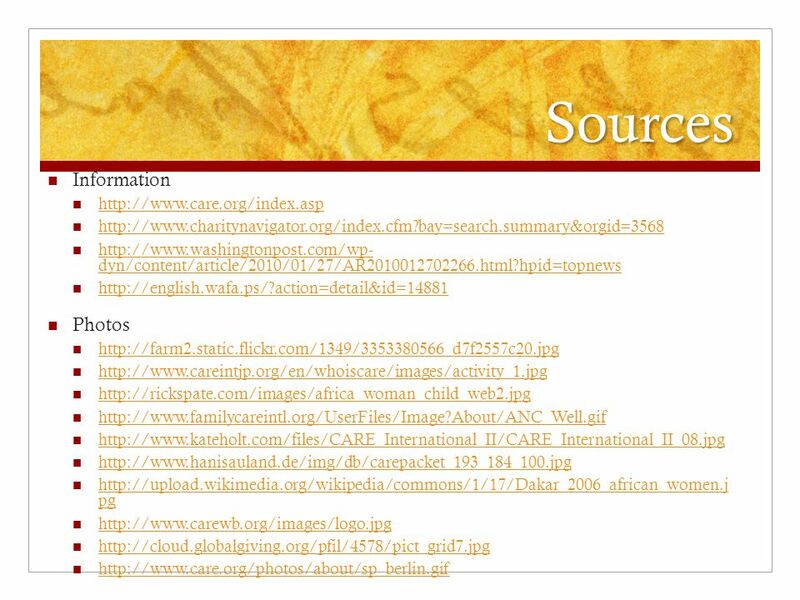 Copyright 2009 Pearson Education, Inc., Publishing as Longman Longman PoliticalScienceInteractive Magleby & Light Government by the People Chapter 19 Making. 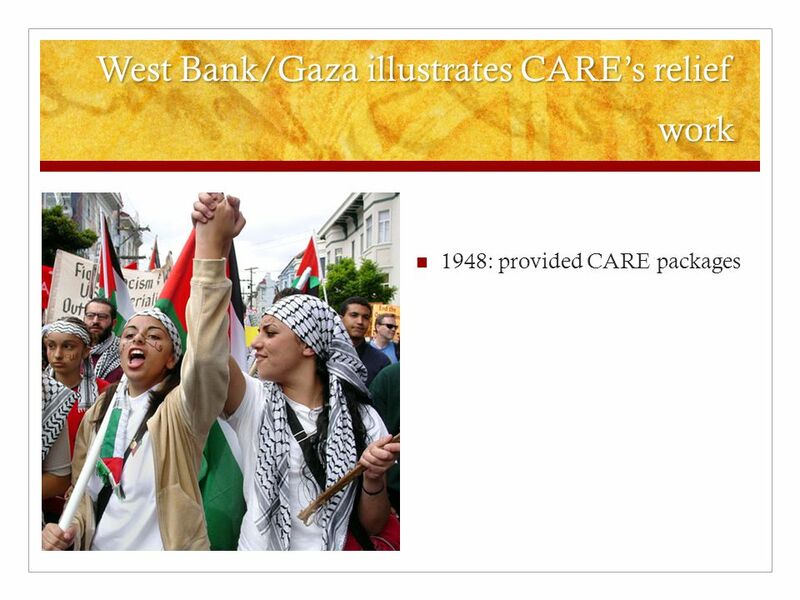 CARE International And CARE USA “Defending Dignity. Fighting Poverty.” Molly Cunningham.